Our epic adventure tour places you right at the heart of mountainous Guizhou province, a region in China so remote that its natural beauty has remained virtually untouched. We’ll venture deep into the countryside and encounter people whose ancient folk customs date back over hundreds of years. 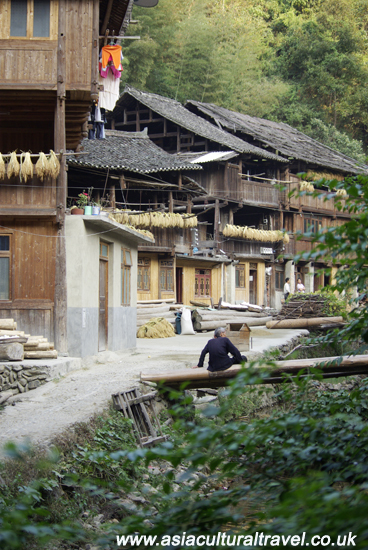 The majority of the tour will be dedicated to visiting villages inhabited by two of China’s most fascinating ethnic minorities: the Dong people and the Miao people. 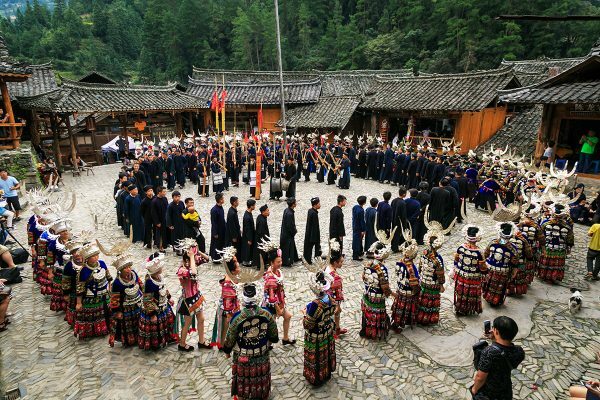 Famed for their passionate folk songs and vibrant dances, a performance in a Dong or Miao village is a truly unforgettable experience. 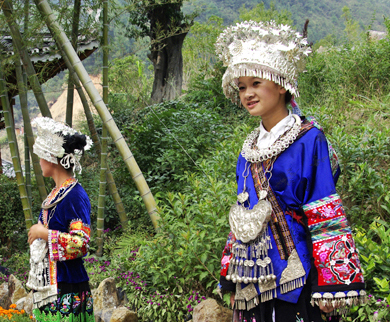 From studying their unique styles of architecture to exploring the stunning countryside that surrounds their villages, our tour is designed to fully immerse you in the authentic culture of the Dong and Miao people. The history of the Miao people is shrouded in mystery, but modern research suggests that they may have been among the earliest settlers in China. Researchers have found that many Chinese words related to rice farming were borrowed from the Miao language, which indicates that the Miao were some of the first rice cultivators in the country and may have done so over 5,000 years ago! This, along with DNA evidence, connects the Miao to the ancient Daxi people, whose history dates back approximately 5,300 to 6,000 years. The Daxi have long been credited as the first cultivators of rice in the Far East, and it appears that the Miao may have been among them. The Miao prefer to live in mountainous areas and have developed a special type of dwelling to this end, known as a diaojiaolou. The front of the house is supported by pillars, whilst the rear is suspended on wooden stilts to keep it level with the mountainside. This makes it look as though the building is hanging off of the mountain! The Miao are adept at carpentry and wickerwork, but are best known for their mastery of silversmithing, embroidery, and batik. The Miao women hand weave and dye cloth, then sew and embroider it by hand to make all of their clothes. The patterns incorporate themes based partly on the natural world and partly on the artists’ imagination, which is why dragons and phoenixes often feature in Miao craftwork and why certain animals and plants look different to how they appear in real life. Their creativity is legendary and their traditional dress, resplendent with colour, is the highlight of any traditional Miao festival. 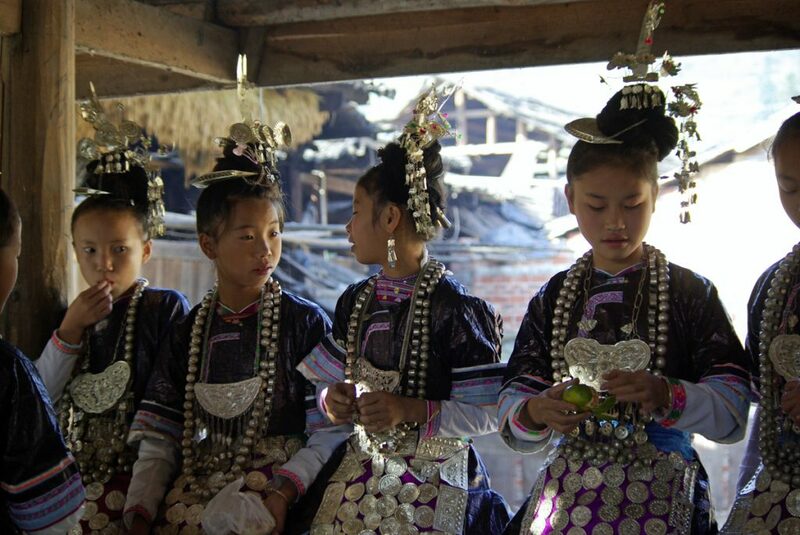 Discover more about the Miao Ethnic Group. 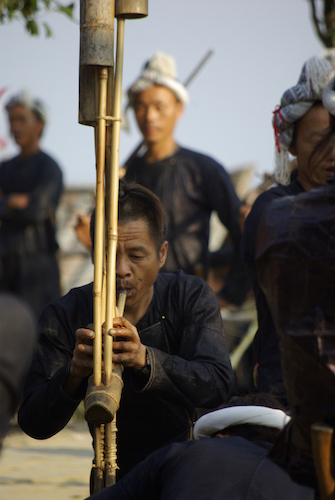 Performances in Miao villages will always be set to music and, when it comes to the Miao people, the lusheng is the instrument of choice, although other instruments like the suona and the copper drum are also popular. 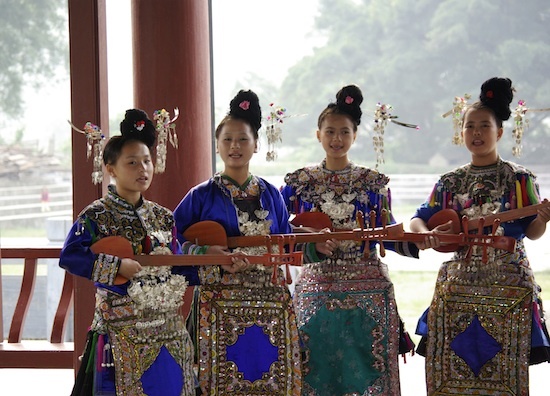 During many festivals, the lusheng dance will be the focal attraction. 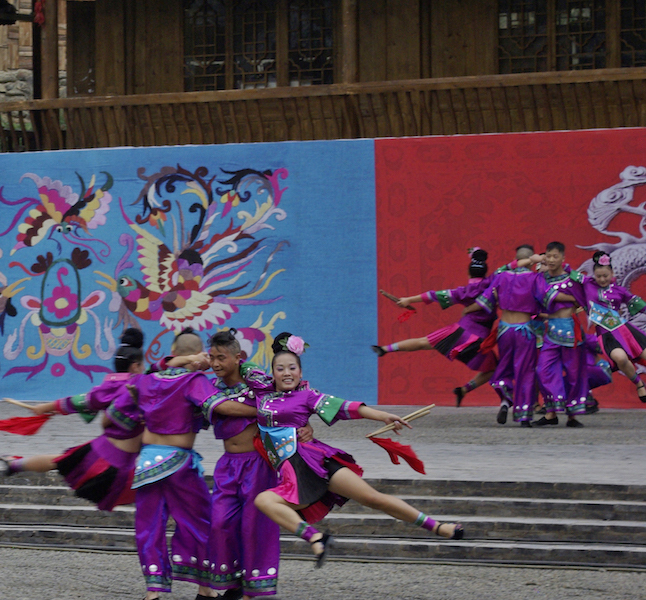 It is a traditional dance performed by the Miao people in southeast Guizhou. Read more about Miao Performance. Suona: A Chinese wind instrument. It is made up of a horn with a double reed that makes a distinctively loud and high-pitched sound. It comes in several sizes and the size of the horn affects the sound it makes. It is used throughout China in ritual music and folk music. 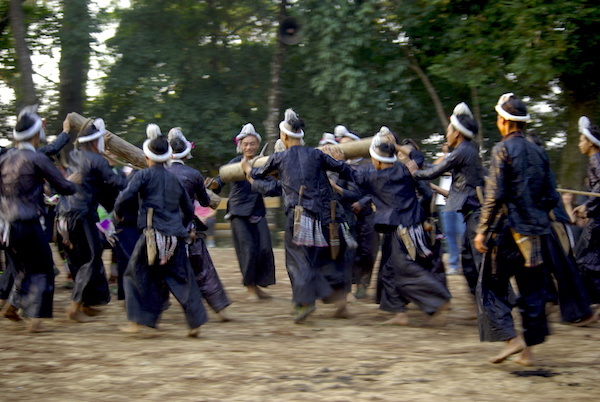 The Dong ethnic group are renowned for their musical ability and their skill as carpenters. From the Kam Grand Choirs to the looming Drum Towers, Dong villages are a place of harmony and wonder. 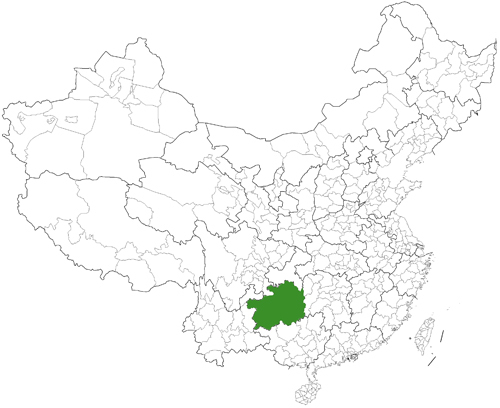 The Dong people boast a population of nearly 3 million in China and the vast majority of them are concentrated in eastern Guizhou province, western Hunan province, and northern Guangxi. The Dong people’s talent and penchant for music evolved from their habit of singing folk songs while they were working or farming. Many of these songs are centred on enchanting folk tales that were based around topics related to daily life, mainly about the pursuit of true love. The beauty of their music is matched only by the intricacy of their architecture, manifested in their characteristic Drum Towers and Wind-Rain Bridges. Nowadays most Dong people still follow a traditional way of life in their hometowns. To this day you can still see their magnificent architecture, their traditional style of dress, and their vibrant local festivals. Unfortunately this idyllic situation appears to be waning. More and more young people from the Dong community are being drawn to cities in the hopes of embracing modernity and achieving a better quality of life. The arts of batik, embroidery, silverwork, and even singing are gradually being lost. 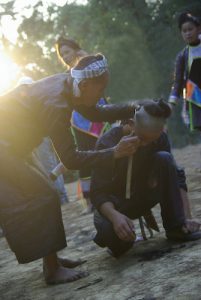 Nowadays, in some Dong villages, you can still enjoy some authentic “performances” that are not staged for tourists. But who knows how long this opportunity will last? 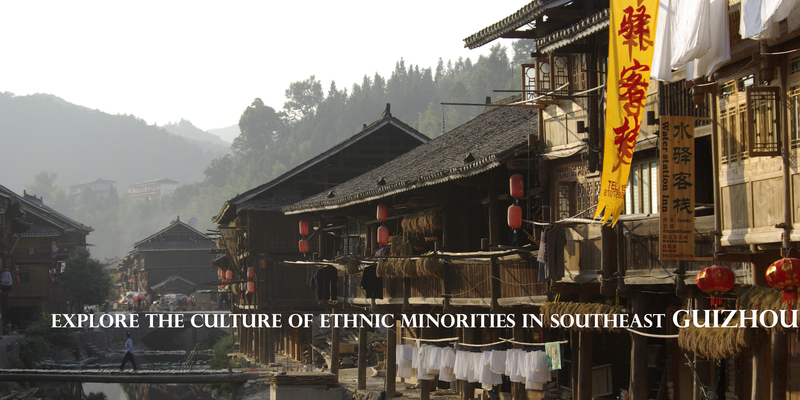 Discover more about the Dong Ethnic Group. The most talented singers in any Dong village make up what are called Kam Grand Choirs. The Kam Grand Choir tradition is thought to date back all the way to the Warring States Period (475BC-221 B.C. ), with a history of over 2,500 years behind it. In 2009, it was made a World Class Intangible Cultural Heritage by UNESCO. A Kam Grand Choir is a polyphonic choir that sings without the help of a conductor or any accompanying orchestra. Their songs are designed to imitate the natural world, such as the chirping of insects, the gurgling of streams, the whistling of the wind and other soothing natural sounds. Read more about Dong Performance. 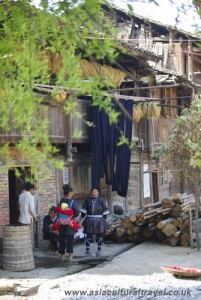 Xiaohuang is often referred to as the Village of Songs because the Dong people in this village are particularly accomplished at performing polyphonic folk songs known as “Dage” or Grand Songs. In 1996 the Ministry of Culture of the People’s Republic of China bestowed the title “the Village of China Folk Art” on Xiaohuang because of its preservation of the Dong singing tradition. 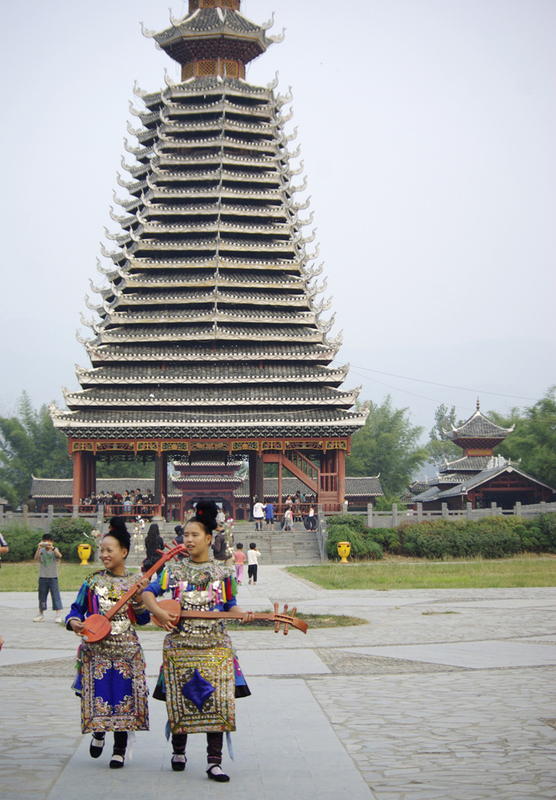 In fact, over one third of the population of Xiaohuang is made up of professional folk singers! Read more about Xiaohuang. Zhaoxing is one of the most famous Dong villages in China, in part due to its size but predominantly due to the fact that it has five Drum Towers. Each tower is specially named in order to promote a certain virtue, and is different in terms of its method of construction, size, height, and external appearance. According to local legend, this village was supposedly founded during the Song Dynasty (960-1279), meaning the village ancestors settled there over 840 years ago! 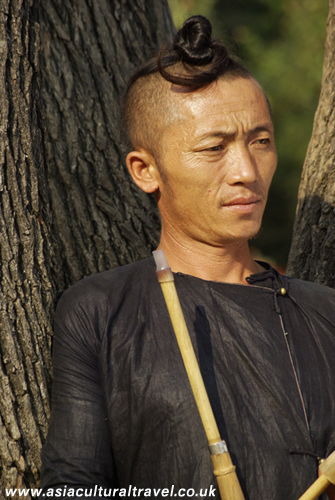 Read more about Zhaoxing. Obscured by misty mountains and dense green forests, Yintan is a gem largely hidden from the rest of the world. The gate is flanked by ancient Chinese yew trees, which gives the village an air of mysticism as you enter. Even the name “Yintan”, meaning “Small Silver Lake”, has a certain ethereal quality to it. In fact, Yintan is so isolated that almost every household in the village has a barrel for preparing indigo dye and almost every piece of clothing worn by the locals will have been made entirely by them. Read more about Yintan. There are actually about 19 small villages that make up Sanbao, with three main villages, making it the largest Dong village in China. This cluster of villages lies along the banks of the Duliu River and is flanked by stunning banyan trees, which stretch for over a kilometre along the river’s banks. Many of them are over 300 years old! Aside from these marvellous natural wonders, Sanbao is resplendent with stunning architecture, including a series of drum towers that have earned it accolade over the years. The magnificent Chezhai Drum Tower was built during the Qing Dynasty (1644-1912) and it has remained undamaged for over 130 years, in spite of having been built without the use of nails or rivets. Read more about Sanbao. 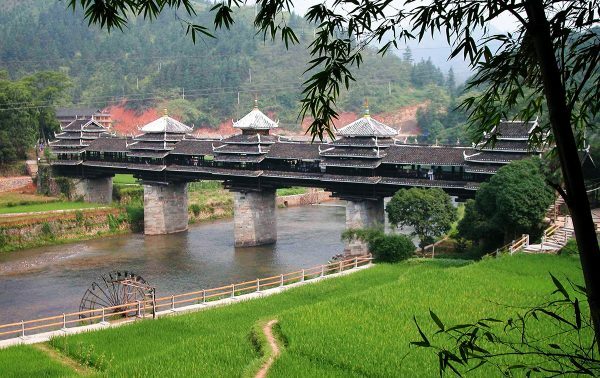 The main draw to this scenic area is Chengyang Wind-Rain Bridge, which was built in 1912 and is now over 100 years old. Though there are hundreds of wind-rain bridges in the area, this one is considered the most magnificent. It is also known as Yongji or Panlong Bridge and is made up of 2 platforms, 3 piers, 5 pavilions, 19 verandas, and 3 floors, giving it the appearance more of a palace than a bridge! Read more about Chengyang. Nestled on the northern side of Leigong Hill, surrounded by mountains covered in rich greenery and split in half by the fiercely beautiful Baishui or White Water River, Xijiang prides itself on being the largest Miao village in China, and perhaps the largest Miao village in the world. 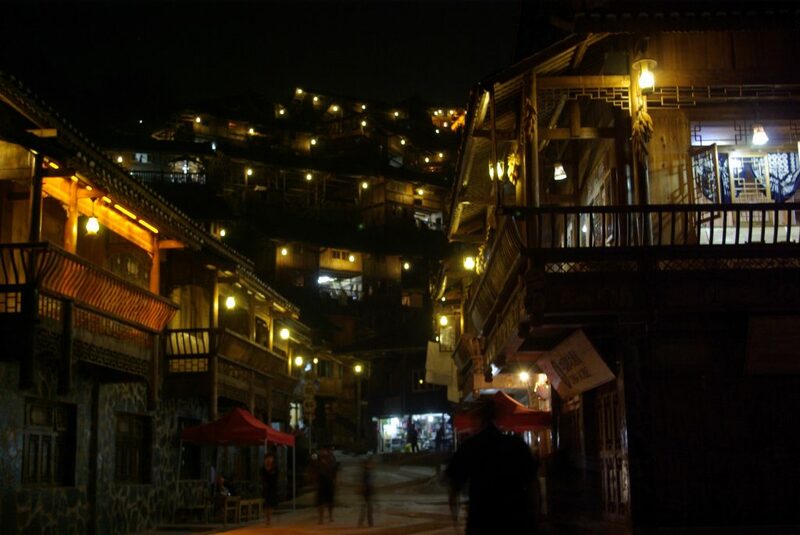 It is actually made up of a cluster of Miao villages, so it is more like a township than a village proper. 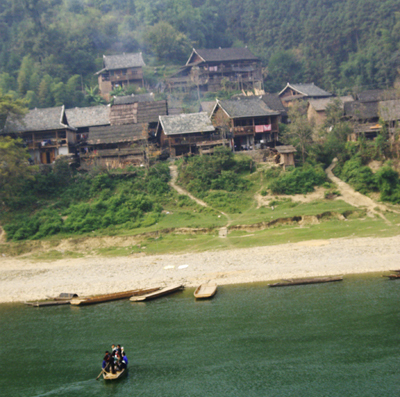 The Diaojiaolou, a kind of stilted wooden dwelling built by the Miao people, stretch up the hillsides on either side of the river. The banks of the river are connected by vast numbers of stunning Wind-Rain bridges, which look like tiny palaces hovering over the rushing water. If you visit the traditional old street, you’ll be met with many wonderful snack stalls, restaurants, and stores selling locally produced craftworks such as batik textiles, silverwork, and fine embroidery. The Miao people are famed for their skill at these particular arts so a small, handmade trinket from Xijiang would make the perfect souvenir. Discover more about Xijiang. 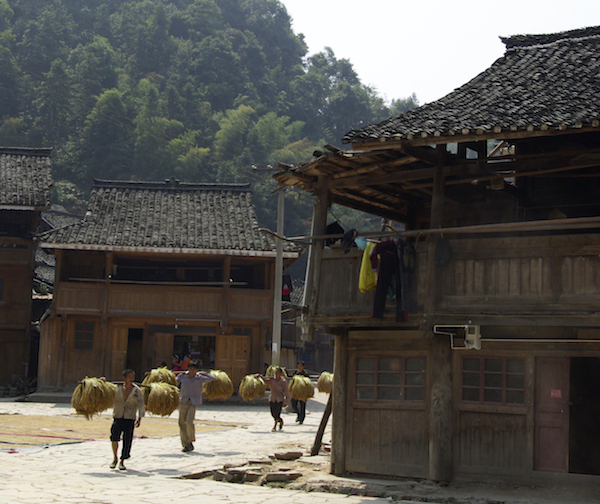 Basha is a village unlike any other in China. 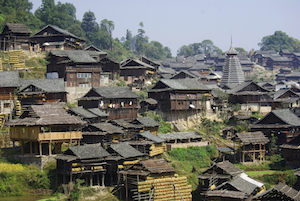 It is home to members of the Miao ethnic minority but it is unique amongst all other Miao communities. This is because it is the only place in China where residents are still legally allowed to own and carry guns. When the Chinese government tried to confiscate the guns from the members of Basha village, they refused and it was decided that they should be allowed to keep their rifles as part of their rich cultural heritage. To this day, visitors are welcomed with a thrilling display of expert shooting by the local men. Due to their cautious nature, the villagers have virtually isolated themselves from the outside world. They are almost completely self-sufficient and still maintain practices and customs that date back hundreds of years. Discover more about Basha. There are only 500 villagers living in Langde Upper Village and all of them come from only ten different family lines. 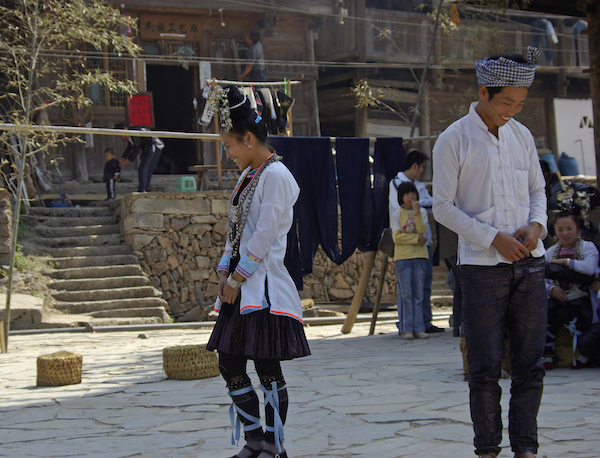 The village has become like a museum, preserving ancient buildings and local customs that have been practised by the Miao for hundreds of years. The village rests by a stream and is nestled deep within the mountains. There are five “flower roads” that lead into the village and three wooden gatehouses, or village gates, at the northern, western, and eastern entrances to the village. These roads are paved with smooth blue flagstones or rippling cobblestones that, alongside the looming stilted houses, look incredibly picturesque. 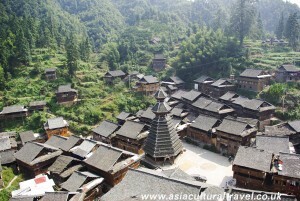 Uncover more about Langde Upper Village. 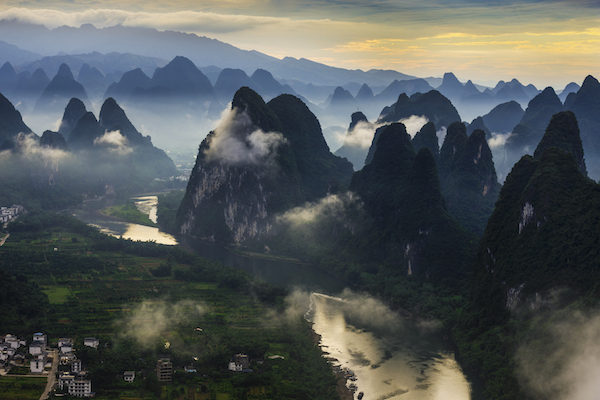 In China, there is a popular saying which goes “the scenery in Guilin is the greatest under heaven” (桂林山水甲天下). The lush Karst Mountains, blossoming osmanthus trees, and majestic Li River combine to make an ethereal paradise. It is no wonder that, historically, people doubted its existence! 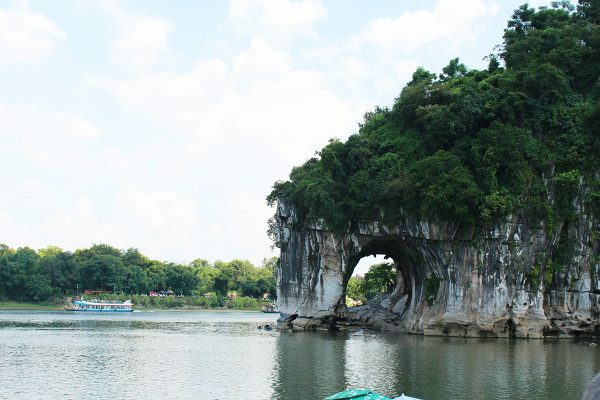 Read more about Guilin. As you travel along the Li River, you’ll notice wild and domestic water buffalo grazing on the riverbanks or swimming in the river, farmers with their conical hats working on the rice paddies, and a unique type of fisherman found only in Guangxi. These ingenious fishermen use cormorants to fish for them, which they train from birth. These large, black waterfowl dive into the rushing water, swimming underneath the surface and snapping up fish. They then return to the boat, where the fisherman pulls the fish out of their gullets. The fisherman will have tied a fine thread around the cormorant’s throat, which is what stops it from swallowing the fish. 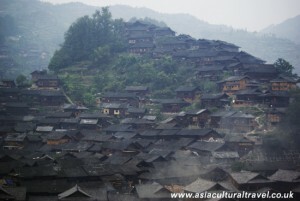 Diaojiaolou is a kind of dwelling popular among several of the ethnic minority communities throughout southern China. The word “diaojiao” (吊脚) in Chinese means “hanging feet” and “lou” (楼) means “building”, so diaojiaolou literally means “hanging feet building”. They are so named because of their unusual appearance. 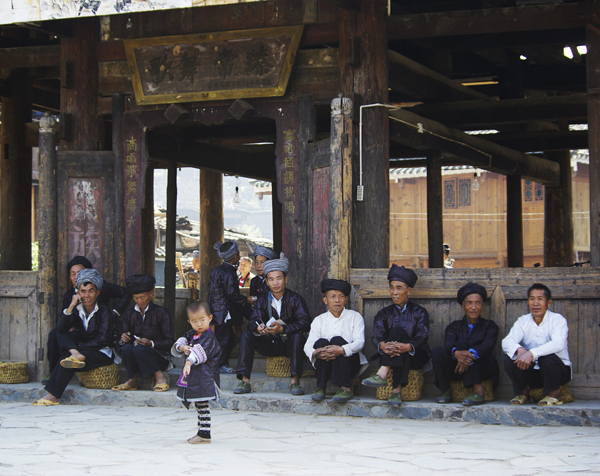 The history of the diaojiaolou stretches back over 500 years and they are widespread throughout Yunnan, Guangxi, Hunan, Guizhou, Hubei, and Sichuan province, but differ in appearance depending on the ethnic group who built them. During our tour, we will have the opportunity to compare the Dong-style diaojiaolou with the Miao-style diaojiaolou. Read more about Diaojiaolou. Jiaxiu Tower has long been the symbol of Guiyang, the provincial capital of Guizhou, and yet it appears to suffer from rather mixed luck. On the one hand, the tower was supposedly responsible for the success of three Guizhou scholars in the imperial examination. On the other hand, it’s been destroyed and rebuilt six times. It is sometimes referred to as First Scholar’s Tower because the term “jiaxiu” can be interpreted to mean “first scholar” or “to come first in the imperial examinations” and the tower was initially built to encourage local scholars to study hard and perform well. While it seems it managed to achieve its aim, evidently whatever good luck the building had went to the scholars and left it with none for itself! Read more about Jiaxiu Tower. Sample the signature dishes of the delicious local cuisine. What information will we provide you with in advance? Specific information about each village on your trip. On the first day of our unforgettable tour of Guizhou province, we’ll be meeting in the provincial capital of Guiyang. We will arrange our meeting time and place according to everyone’s flights. In the late afternoon, we’ll be visiting the most iconic landmark in Guiyang: Jiaxiu Tower. This traditional Chinese pavilion was originally constructed in 1598, during the Ming Dynasty. Once we’ve visited the tower, we’ll have dinner at a local restaurant nearby. After dinner, you’ll be free to enjoy the spectacular view of the tower as it is illuminated at night. If you’re lucky, you might even see some of the locals setting off Chinese lanterns in the square! As you wander leisurely around the tower, you’ll have the opportunity to witness what real local life is like in a typical Chinese city. 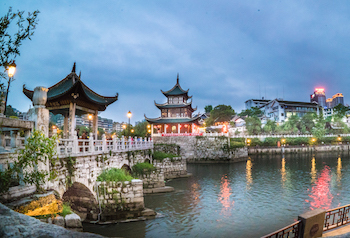 Read more about Guiyang. Note: We can meet at the airport or the hotel. If your flight is in the late evening or the night, you may feel too tired to join us, so you can miss the dinner and go to the hotel directly if you wish. In the morning, we will travel from Guiyang to the bustling city of Kaili, which will take approximately 3 hours. In Kaili, we’ll have the option to stop for lunch and sample some of the delectable local cuisine. After that, it should only take us about 1 hour to get from Kaili to the village of Xijiang. After we’ve enjoyed an eye-opening guided tour of the village, there may still be some time for you to explore the village on your own before we have dinner together. After waking up to the peaceful sounds of rural life in Xijiang, we will arrange to see a traditional performance by the local Miao people. After lunch, our guide will organise a hike up the nearby South Hill so we can enjoy a panoramic view of the whole village from the top. Once we’re finished with the hike, everyone is free to explore the village at their leisure. In the late afternoon, we will make the short journey to the small Miao village of Langde Upper Village. In the morning, we will take a guided tour of the village, which will culminate in a spectacular traditional performance by the local people in the centre of the village. Once the formal part of the tour is over, you are free to either explore the village at your leisure or stay with our guide and do some shopping. 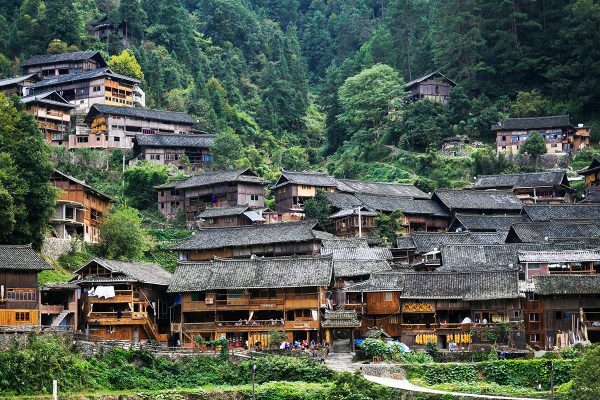 Langde Upper Village is the ideal place to pick up a few souvenirs related to the Miao ethnic minority, as there are many quaint craft shops selling their characteristic silver jewellery and even their traditional clothes. If you want to buy something, our guide will be at the ready to help you translate and get the best bargain! In the afternoon, we will travel to the town of Rongjiang. Accommodation: Three-Star hotel in Rongjiang. In the morning, we will travel from Rongjiang to Sanbao. 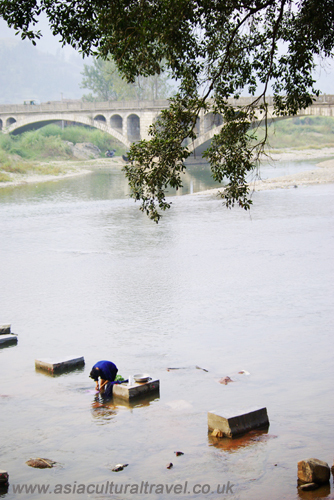 Sanbao is a typical Dong ethnic minority village lying on the banks of the majestic Duliu River. Once we have arrived, we will enjoy a short scenic hike along the river bank. In the afternoon, we will travel to the town of Congjiang. Accommodation: Three-Star hotel in Congjiang. In the morning, we will visit the isolated Dong village of Yintan and soak in the peaceful atmosphere before returning to Congjiang for lunch. In stark contrast to the tranquillity of the morning, the afternoon will be spent in the Miao village of Basha, where we will be greeted by raucous rifle displays and rowdy musical performances! As we venture into the renowned village of Xiaohuang, known throughout China as the “Village of Songs”, we will finally get to enjoy an unforgettable performance by one of the Dong people’s Kam Grand Choirs! 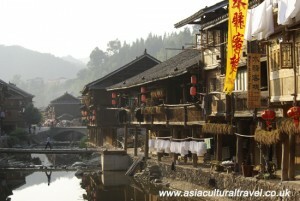 In the late afternoon, we will travel to the village of Zhaoxing. We will dedicate the entire day to exploring the beauty and tranquillity of Zhaoxing. In particular, we’ll focus on visiting each of the five marvellous Drum Towers that can be found throughout the village. In the evening, we will have another opportunity to watch a traditional Dong performance by the locals. This performance will be noticeably distinct from the one we will have seen in Xiaohuang, and will give you an insight into the subtle dissimilarities between different Dong communities. In the morning, we will travel to Chengyang, which is celebrated as the home of the most beautiful Wind-Rain Bridge in all of China. This is the last Dong village we will visit, so please feel free to explore at your own pace and soak up the atmosphere. Accommodation: Well-equipped traditional hotel in Chengyang. Guilin is widely considered to be one of the most beautiful, if not the most beautiful, places in China according to many tourists. It will take us about 3 hours to get there, but fortunately we will get to enjoy stunning views of the mountains along the way. Dinner: Not included. Guests are free to explore the area and sample the local food themselves. The Li River, also known as Lijiang, is the most famous scenic spot in all of Guangxi. It is so iconic that a tableau of the Li River is featured on the Chinese 20 Yuan note. The river is surrounded by Karst Mountains, which boast such unusual shapes and verdant greenery that they have an almost mythical appearance. In order to experience the majesty of the Karst Mountains first-hand, we will take a bamboo raft down the Li River. We will also have the opportunity to stop and explore a natural Karst cave. Once the tour has ended, you are free to head home or continue your travels in China alone. Guilin has an airport, from which you can easily fly to large cities such as Beijing, Shanghai, or Guangzhou. Please Note: You can choose to stick to this tour entirely, or you can just incorporate it as part of your wider plans to travel across China. We can provide you with information and help you with any other travel plans you may have if you need us to. We also provide a hotel booking service and a flight or train booking service for all of our members’ traveling in China outside of the 11 designated days of the tour. We will also provide a consultancy service for you, which will help you to plan your journey across China and give you useful tips on traveling in China. 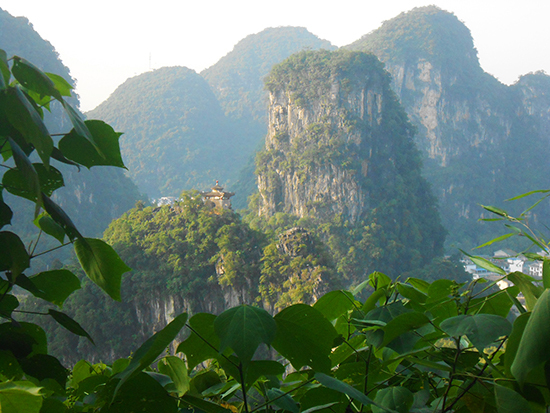 If you plan on continuing your exploration of Guangxi, we strongly recommend you visit the town of Yangshuo. Resting on the Li River and surrounded by the Karst Mountains, this backpacker’s paradise is the ideal place to relax and meet a few fellow foreign travellers. Including: 11 nights of accommodation; all entrance fees to the attractions; all meals during the 9 days spent in the mountainous region of southeastern Guizhou; all transportation costs during designated tour times; the services of an English speaking guide; a pdf file with information about Dong and Miao minorities, and the destinations we will visit; help with any further travel in China following the tour. Please Note: The cost is based on the subscription of no less than 4 participants; the maximum number of participants being 10. Accommodation: We will stay in 4-Star hotels, 3-Star hotels, and local Guesthouses, as specified in the itinerary. Please Note: There might not be en-suite bathrooms available in the Diaojiaolou Guesthouse because of its design. In this instance, all rooms will have shared toilets and bathrooms. 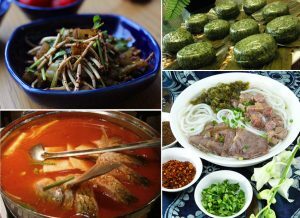 Food: We will provide 3 meals per day, consisting of local Chinese food, when staying in the mountainous region of southeastern Guizhou. Our guide can help you order food while we are in Guilin.